PLEASE NOTE THIS EVENT HAS BEEN CANCELLED. WE HOPE TO RUN IT IN A FEW WEEKS. Yamaji is the name used to identify people in the Murchison and Gascoyne regions of Western Australia. Yamaji Country is in the Mid West region of Western Australia and stretches from Carnarvon in the north of Meekatharra in the east, to Jurien in the south. The Yamaji area covers nearly one fifth of Western Australia and incorporates seven main language groups. The Naaguja people are traditional owners of the southern coastal part of the region. 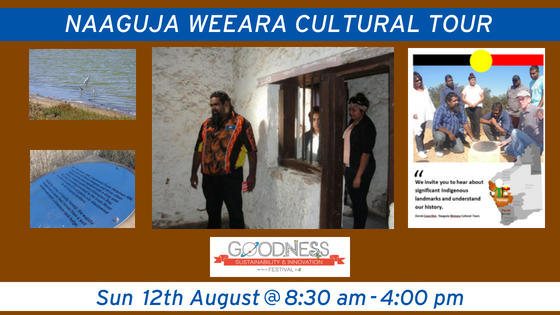 Travelling by coach, your Naaguja guides will share stories on early Aboriginal laws and customs which are the foundation of the social structures, explain differentiating skin groups and how they are guided by the seasons. Your journey will take you throughout Geraldton, to Bootenal Springs a site of both early European settlement and the local Aboriginal people, Central Greenough to understand the coldness behind the walls of the original prison before heading to Ellendale Pool for some lunch to soak in the landscape. Your Naaguja guides will teach men and women how they should behave, places they can go, food they can eat and places where they can drink water. Experience their strong sense of identity and spirit as they are determined to keep their culture strong for their children and young people. Tour led by local Naaguja People. Commentary about significant Indigenous landmarks, their Indigenous names and history. Learn of the first contacts between our people and the Europeans. View natural water springs that provided fresh water drinking holes. Viewing bush tucker growing in the wild. Encounter wildlife. Sumptuous Lunch feast of local tucker and morning tea. Meet and talk with our Aboriginal crew.